Henrik Ballast is a mountain of a man, barrel-chested and broad-shouldered with large hands and feet and virtually no neck. 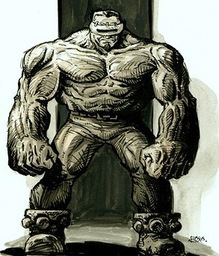 His musculature is unnatural but not grotesque, especially when concealed beneath loose-fitting clothing, and his hide has the feel and appearance of sun-exposed leather. He often dresses in an Imperial Guard uniform sized for an Ogryn and tends to grin a lot. Henrik was born to a primitive world on the edge of the Calixis system that was absorbed into the Imperium during his grandfather’s time. As a young man, Henrik joined up with the local Arbites, both to help keep order in his home and for the chance to receive advanced Imperial teaching. Eager for advancement, Henrik worked hard to push through the ranks. He was given the opportunity to receive officer’s training off-world and jumped at the chance. Unfortunately, while making its long run, the transport Henrik was on was caught in a warp-gravity trap generated by a strange xenos installation following a mishap caused by the ship’s Navigator. Most of the crew and passengers were killed but Henrik was able to survive. With his natural leadership abilities, he organized the survivors (most of whom were bilge-mutants) into a living colony. He led the group for decades, incorporating other trapped ship survivors as they arrived. Visitations to the xenos moon caused Henrik’s body to mutate, which only made him relate to his mutant subjects even more. Finally, the chance came to escape the dark moon when the Tyrant Sun arrived in system. With the help of that crew, the xenos installation was destroyed. But when Henrik was presented with the opportunity to leave the moon, he realized that he could never go back to the Imperium with his mutations. And besides, he gotten quite used to being in charge, even if it was of a ragtag colony. He instead decided to remain in the dark moon colony, serving as its leader, though he also brokered a deal with the D’Stayn Dynasty. In exchange for regular supplies, the D’Stayn ships would always be welcome around the dark moon. Henrik seems to be attracted to Eurydice, a feeling she most certainly does not return.